Along with the bison, the wolf has become an emblem of such primal wilderness. By 1926, wolves had been driven to extinction in Yellowstone: part of a systemic slaughter of predators thought to be vermin and a threat to human interests. Despite successful efforts to undo mistakes of the past and restore wolves, today they still occupy less than 10 percent of their historic range and face threats nearly everywhere they live.1http://www.biologicaldiversity.org/campaigns/gray_wolves/index.html The controversies surrounding the reintroduction of wolves in the lower 48 states has again reached critical mass as politicians and agencies in states such as Idaho, Washington, and Wyoming are engaged in active wolf killing programs and efforts to de-list wolves from the Endangered Species Act, after these highly social and intelligent animals have just barely bounced back from the brink of extinction. Wolves are again in the bullseye, as state, federal, environmental, and private stakeholders vie for influence over these animals future. However, since wolves have been reintroduced to Yellowstone we have bore witness to a beautiful and fascinating phenomena known as trophic cascade. Wolves are a keystone species and are top predators in a complex ecosystem. Reintroducing, as George Monbiot says, “even a small number of wolves transformed not only the ecosystem but the physical geography of the land.”2https://www.ted.com/talks/george_monbiot_for_more_wonder_rewild_the_world/transcript?language=en Wolves changed the behavior of deer and elk, which, over time, changed vegetation and erosion. Eventually the rivers changed their courses, meandering less, creating more pools and riffles, which increased animal habitat. When the howls of wolves return to our wild lands we are listening to the sound of a vibrant ecosystem at work. In his environmental cycle Wolf Music, Canadian composer R. Murray Schafer states, “Wolf music, wilderness music—they are the same. This is what we share with the wolves; both need space. When the environment is too populated, the wolves retreat and are silent. Our music too clings to silence—silence and space.” If we are to survive, we must have clean rivers, healthy forests, and a diversity of life. This means leaving space for other creatures and other cultures to thrive. Wolf call and road noise. Hayden Valley, c. 9 p.m. Recording by Justin Ralls. I recently spent several days in Yellowstone and was fortunate enough to witness a small pack of wolves in Hayden Valley, early in the morning and late in the evening, just after an elk kill on the Yellowstone River. 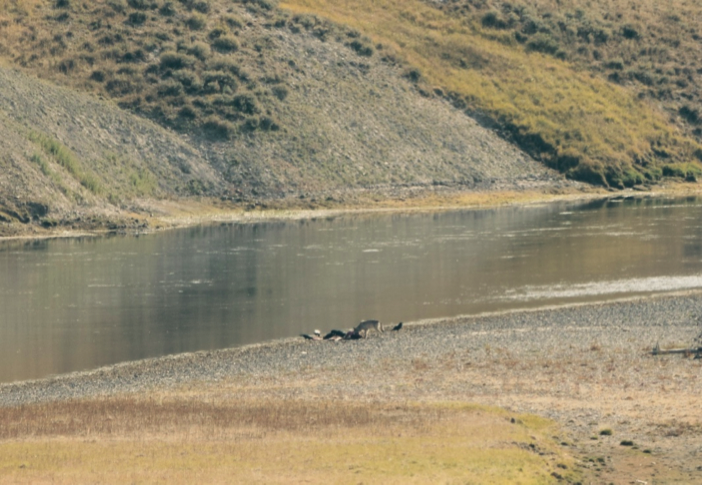 The great irony of Yellowstone is that you are more likely to see wildlife along the road than hiking in the backcountry. As special and unique as it was to witness wolves behaving in their natural habitat, it was interesting as well to witness the various behaviors of visitors. Crowds congregate along viewpoints or off the side of the road. Veteran spotters (some waiting since 4:45 a.m.) keep a sharp eye with huge spotting scopes, mingling amidst a casual passerby looking for an easy sighting. Tour busses stop for a quick glance before moving on to the next sight as park rangers manage traffic, cavort with visitors and occasionally berate them for various transgressions such as walking too close to the animals, or simply parking in the middle of the road. We were fortunate enough to see wolves, grizzly, bison, and bald eagles all within the same scene. 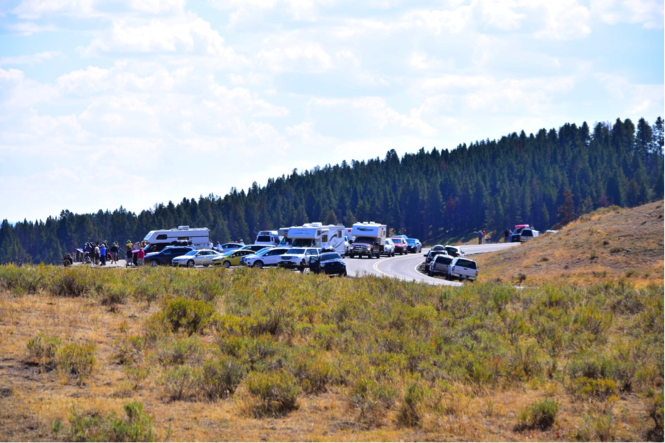 A carcass in Yellowstone indeed draws a crowd. 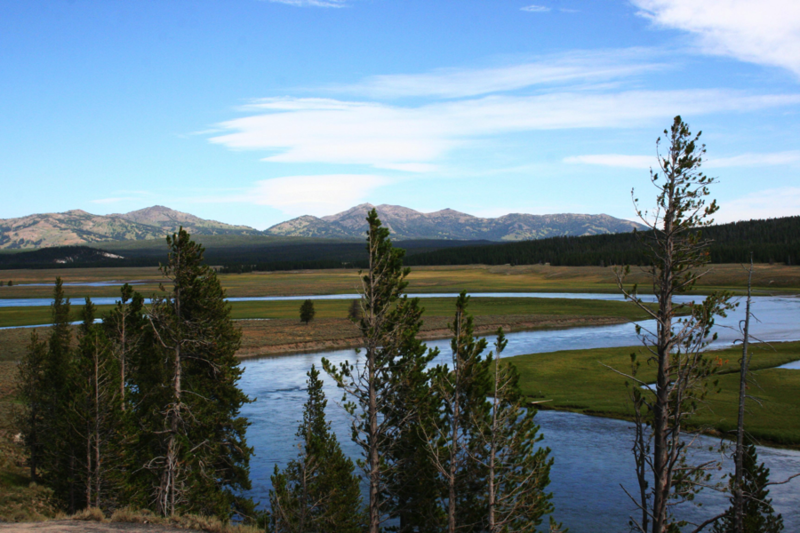 Hayden Valley viewpoint. Photo: Justin Ralls. Yet, along with the eco-drama, one of the most profound moments was when the wolves began howling and people promptly shushed each other over the ambience of road traffic and car doors, hoping for a comfortable sound bite of one of Yellowstone’s iconic, keynote sounds. Listening to people talk about and admire wolves while watching (and listening) to them, even within the carnival of Yellowstone tourism, was refreshing and inspiring. Even with our reverence held at a distance, something draws us to these animals. We obsess over their presence, whether viewed as vermin or in veneration, spectacle or sacrality; they are ambassadors to something wild within ourselves. Wolf and ravens on elk carcass, Hayden Valley. Photo: Justin Ralls. The condition of Yellowstone is one of immense change, both macro and micro. The main roads of the park sit in the caldera of the largest active volcano in the world. The landscape is bubbling, steaming, and constantly settling into new forms. There were two active wildfires in the area while we were there—a reminder of the cycles of disturbance and rebirth that for eons have shaped forests and grasslands. The night before our wolf sighting, we had stopped at the same viewpoint to watch an elk herd at dusk; the next day, one of these young elk was the meal of countless other animals; and by the afternoon, the carcass had all but disappeared. And that evening, with the wolves downriver and bear gone, the elk had returned. Of Wolves and Rivers references and sanctifies through music both the relationship between wolves and rivers and between humans and their environment. Listen. When the wolf speaks, it is an ancient voice calling us back to participate in the web of life: to live in accord with the natural world and hear it restore itself. When we make space for wolves, we make space for rivers and we make space for ourselves to dream and make music of the landscape. UPDATE: Watch the full-length video of Cadillac Moon Ensemble’s World Premiere performance of Justin Ralls’ Of Wolves and Rivers. This entry was posted in essays and tagged Composers Network, concerts & events, ecology, guest author, National Parks, original video, wildlife conservation by Justin Ralls. Bookmark the permalink.